Bruce Campbell's iconic Ash Williams character is more popular than ever now, thanks to the hit Starz TV series Ash vs. Evil Dead, which will return for Season 2 later this year. For those who still prefer the original Evil Dead movies, a new board game should be just up your alley. Space Goat Productions and StudioCanal have announced that they are coming together to create a new game based on the 1987 sequel Evil Dead 2: Dead by Dawn. The campaign offers a standard and deluxe edition for donors to select from. 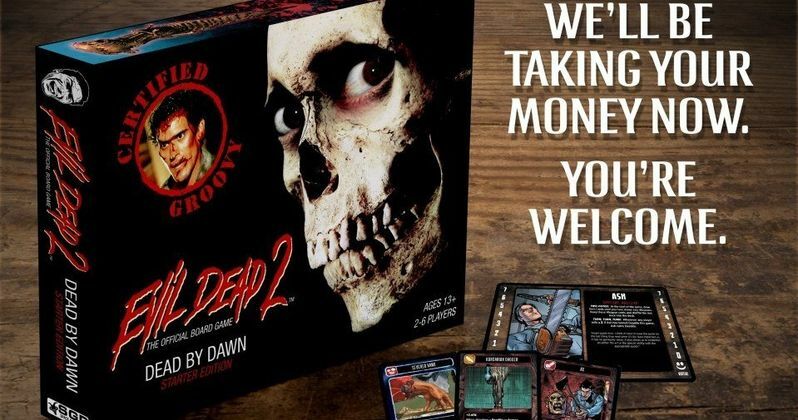 Featuring at least 8 custom figures and art depicting the terrifying and iconic characters, monsters, and locales from the film, the official Evil Dead 2 Board Game is the tabletop experience for Evil Dead 2 fans. 2-6 players will work together in 60-90 minute sessions to gather pages of the Ex-Mortis while trying to survive demon attacks, supernatural events, and avoid turning into evil deadites themselves. Here's what Space Goat President Shon Bury had to say in a statement. "Kickstarter is a fantastic tool not just to fund cool projects but to make fans aware that those projects exist so they can participate in the creation process. We've built a reputation with the Evil Dead books of really being able to please core Evil Dead fans. We're going to do the same thing with the official board game." The deluxe edition features exclusive figures of Ash Williams, Deadite Henrietta, and a box based on the Necronomicon Ex-Mortis, the Book of the Dead. More figures and features will be added as the campaign goes on, a well as retailer pledge levels. Six lucky fans will also get a chance to get their likeness drawn into either the game or a future Evil Dead 2 comic book. Here's what Evil Dead 2 Board Game Designer Taylor Smith had to say in his statement. "Evil Dead is such a great world to work in. Making a brutal survival horror game filled with jokes and exciting gameplay just came naturally," said. "It's a cooperative game with a twist: Players can turn evil and go after their former allies, who then have to decide to save their Deadite friends or put them down for good and carry on with the mission." Fans can register for updates at EvilDead2BoardGames.com, which reveals that the Kickstarter page for the game will launch in just 13 short days. It isn't known when the game will be available for purchase, but we'll be sure to keep you posted with more updates. In the meantime, take a look at the photo from the official site below.